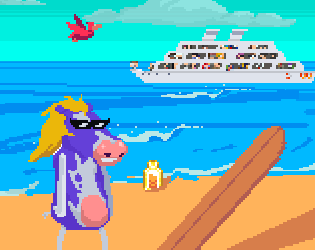 PurpleBit Surfing Cow is a fast-paced arcade game for Android where you control a cow (yes a cow!) who just wants to have fun while chilling and surfing, but gets in trouble when faced with so many obstacles in the sea. To survive in the game, you need to dodge obstacles for as long as possible. This game is a commemorative game to the PurpleBit studio, you can find more about the studio here. We decided to make a fun and challenging game about surfing and while we were thinking about the main character we decided to use their (PurpleBit studio’s) mascot reinvented in a crazy new way, the end result is the craziest thing you’ve ever seen in a game. The goal of the game is simple: Avoid the obstacles. That’s it…! But it’s not an easy task as you’ll soon notice… The game’s difficulty is well balanced so you will just need some patience to master the game. The game has three virtual buttons you can use to move (Back and Forth) as well as (Speed Up). If you go back the board slows down and if you go forward the board speeds up. By ducking you can go faster without changing direction. (Quick Dev Tip) – The best way to keep dodging is to always go back to the original position where you started the game, this way the barrel can’t catch you by surprise, and you’ll only need to go down a little bit in order to survive the wave tube. 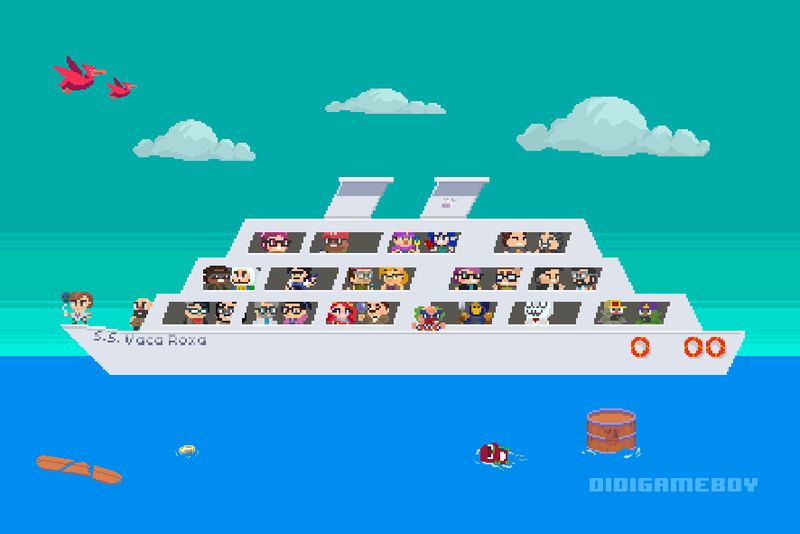 A cruise full of crazy people! A smoking clown who likes to throw a bottle of whiskey into the surf! A barrel that emerges from nowhere! A noisy bird that likes to troll you! A cloud that likes to throw bolts of lightning only at you! A cool soundtrack made by a talented musician! A crazy moo noise when you lose! It all started when Adrien and I worked together on a game called ‘Sensei Says’ for a game jam back in 2016. Since then we both worked on many other games made for game jams such as Ludum Dare. 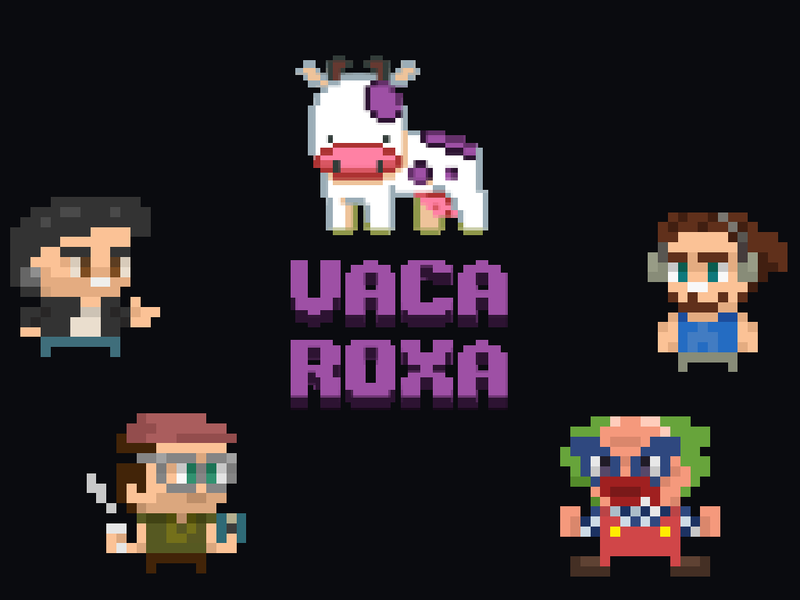 We got experience to grow and joined Maurício and Leonardo to make our first mobile game called ‘Purplebit Surfing Cow’ and published it to the play store. Now we are aiming to make mobile games and publish to all the popular stores. Follow Heavy Sheep Games on Twitter for insight on future releases! This article was Published by Edamame Reviews, Written by Heavy Sheep Games.